Chimpy is a silly monkey banana-crazy who loves playing. He might not be the powerful gorilla King Kong, but this virtual pet is a true sweetie. To hear the monkey talk, say something and he will repeat what you say in a funny voice. It is a great pastime game for kids, making it to the category of games for girls and boys, too. Become banana king kong by playing mini games with the happy monkey! 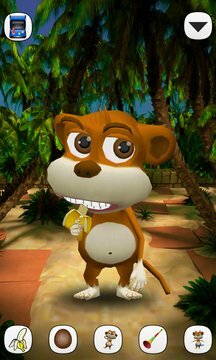 Follow the funny monkey around and make sure he picks up all the bananas while playing the games. - Talk to the monkey and he will repeat what you say in a funny voice. - Make monkey go happy by playing mini games with him. - Tap Chimpy on the belly to see him laugh and show off. - Swipe the screen up and down to make the monkey jump. - Tap Chimpy's tail to make the monkey angry. - Poke, slap, pet and tease the monkey to see what else he can do. Move your monkey around to get as many good bananas as possible. Make sure he doesn't eat a rotten one because it means game over. Talking games bring along laughter and good mood as one of the main purposes of these fun 3d games is to make you enjoy playing with a new talking friend. Don't let yourself spend another day outside the money jungle! 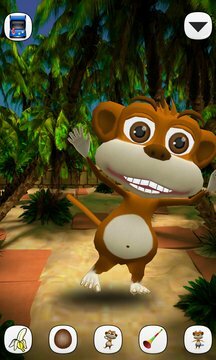 Download Talking Monkey free app and explore the bumpy roads of monkey life!